In a period that has seen the largest NHS hospital building programme, is there anything to be learnt from looking at historic models and ideas? Many architects and health professionals believe that by 2020 the 'mega' post war hospital building will be redundant - replaced with a future healthcare system based on four small scale settings: the home, health and social care centres, community care for the mentally ill and specialist care centres. Is this a return to the healthcare landscape of the 19th century? This community history project doesn't seek to answer these questions, but aims to uncover the hidden heritage of three historic hospitals and a health centre. 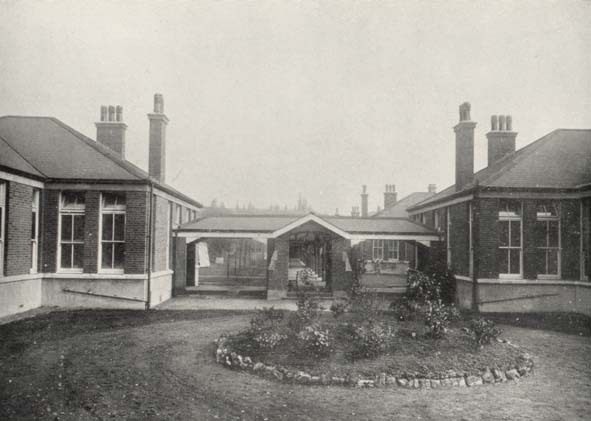 The project has used a wide range of archival sources including hospital records, London Borough of Hackney records, historic and contemporary photographs, architectural plans and drawings and peoples' memories and experiences of these 'palaces of bio-medicine'. The archival information is disparate, located in many repositories including St Bartholomew's Hospital Archive, National Monuments Record Centre, London Metropolitan Archives, the Public Record Office, the Wellcome Library, Hackney Archives and the Royal Institute of British Architects. Historically, little has been done to record, publish and interpret the history and heritage of these healthcare sites and make it available and accessible to a wider audience. Our research will hopefully redress this. The website includes the oral histories of doctors and nurses who worked in some of these institutions from the 1940s to the 1980s, as well as patients. These stories and memories give a vivid account of how these institutions operated, what made them unique, and how healthcare provision has moved on in the last 70 years. Since November 2008 the Hackney Society and a team of volunteers have been working on this community history project. Funded by the Heritage Lottery Fund this project has enabled local people to research, interview and learn about the history of healthcare in Hackney. To date we have trained 37 volunteers as researchers, picture researchers, oral historians and event leaders. Working with Dr Toby Butler, from the University of East London, training sessions have included: ‘An introduction to the History of Healthcare in Hackney’, ‘How to use archives in History of Medicine research’ with Maureen Roberts at the London Metropolitan Archives, ‘Introduction to Oral History’ with Dr Graham Smith from the Oral History Society, and ‘Sound Editing and Digitisation’. This training has enabled volunteers to research and interview former staff and patients of The Mothers’ Hospital, St Leonard’s Hospital, Hackney Hospital and the John Scott Heath Centre. The oral historians have travelled across England interviewing nurses, midwives, doctors, administrative staff, Salvationists and patients. This has resulted in 28 oral history interviews totalling 30 hours of material, which will be deposited at Hackney Archives for the public to use. Extracts of these interviews have been uploaded on to the website. Full interviews have been deposited at Hackney Archives. I would like to thank the following people who have volunteered their time and worked on this project: Peter Archard, Anny Ash, Patricia Bennett, Toby Butler, Inge Clemente, Chris Dorley-Brown, Gopal Dutta, Elena Findley-de Regt, David Francis, Karen Fredericks, Tony Gillett, Ian Grant, Glory Hall, Dianna Hunt, Claudia Jessop, Sue Kinder, Jack Latimer, Evie Learman, Natasha Lewer, Margaret Kennedy, Alex Kitchener, Rachel Kolsky, Imogen Magnus, Hannah Parham, Maureen Roberts, Ann Robey, Graham Smith, Virginia Smith, Michael Somwaru, Marion Try, Suzanne Waters, Amy Wedderburn, Ben Worpole and Ken Worpole. I would also like to thank the people whose stories we recorded: Dr Peter Archard, Eve Barco, Dr Richard Carver, Geoffrey Chilkes, Marina Dean, Christine Edwards, Vera Gold, Jane Haile, Patricia Hewison, Pam Hibbs CBE, Lucy Hunte-Wilton, Muriel King, Dr Meena Krishnamurthy, Dr Rex Last, Dr Jane Leaver, Dr Virbala Patel, Lessept Saunders, Dr Shier, Ida Simpson, Dr Joseph Spitzer, Dr Dan Tunstall-Pedoe, Ayesha Usmani, Margaret White, Hilda Wiffin, Larraine Worpole and Ken Worpole.